Now that the unofficial start to fall has finally arrived, I have dusted off my crock pot or slow cooker as some people like to call it. My crock pot is a pretty cool machine because it is big enough for my family of 5, is a rice cooker, steamer, and pressure cooker. 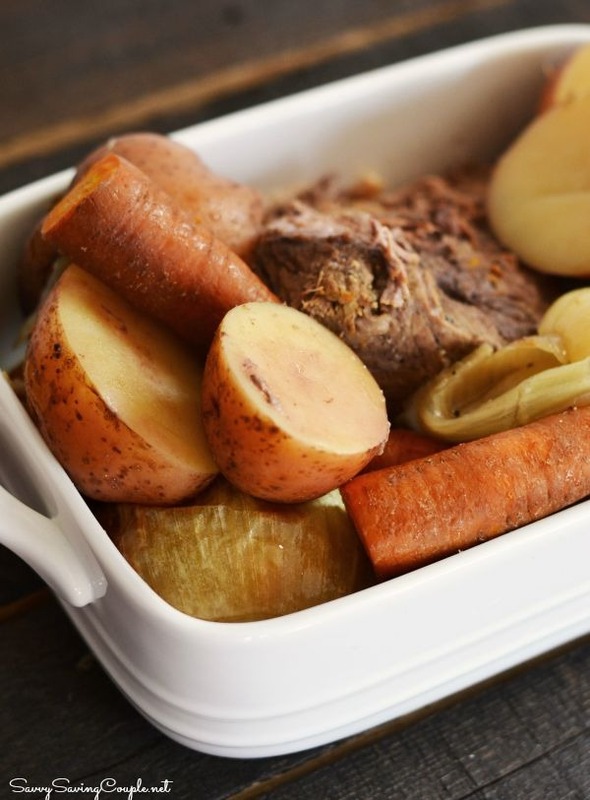 It is perfect for making hearty meals like Pot Roast and Veggies in the Crock Pot. Ever since I was younger, I always loved when my mom would make roast beef aka pot roast. She would make her recipe in the oven alongside carrots, potatoes, and onion covered in tomato paste, and spices. It was really delicious, but to make my nice cut of beef in the oven on a 90 degree day just wasn’t feasible. Why are we hitting heat wave records in September? I am so ready for pumpkins, mums, sweaters–you know typical cool weather things? I want to air my home out, and need that extra blanket at night. I guess for now, I will just have to pretend it is chilly out, and enjoy some crock pot meals. 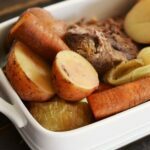 This Pot Roast and Veggies in the Crock Pot was so good-actually too good! It really is awesome that this meal is not high-fat. I cooked it for 8 hours on low and relished in the scent of slow cooked meat, onions, and veggies. Wen dinner time came, I even had a hard time keeping the pot roast in one piece for a picture because it was sooo tender, and melt in your mouth yum!! We actually had enough pot roast left for a yummy port roast, mustard, and American cheese sandwich today–I LOVE that combo! 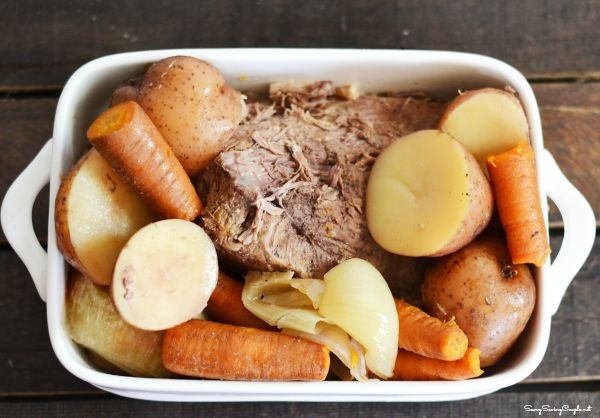 Check out how to make this pot roast below in the blue recipe box widget. I love setting meals up for the day, and having a delicious and hot meal by the end of the day. I do love to cook, but I do not always have time to spend in the kitchen so this Pot Roast and Veggies in the Crock Pot worked out perfectly as my first unofficial fall meal. 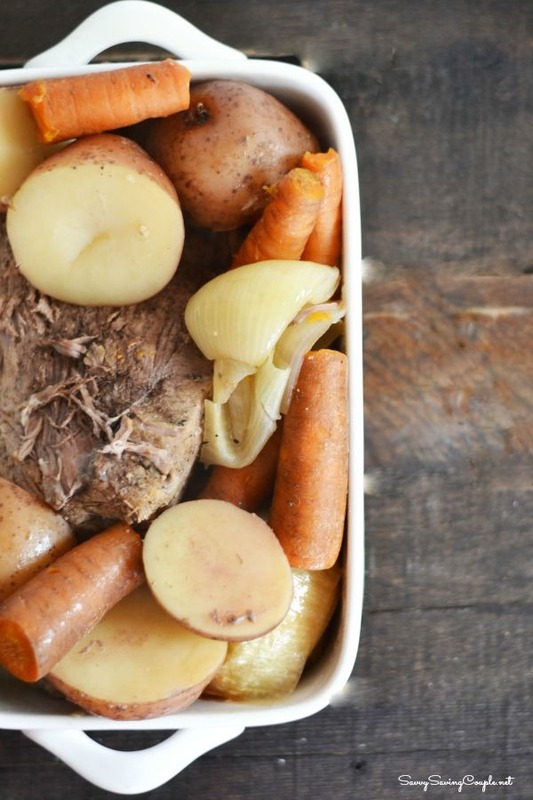 A delicious and simple pot roast and veggies in the crock pot meal. A few simple tricks will produce the most tender and flavor meal. I love pot roast. One of my favorite dinners. I love this recipe because you start it in the morning and then it is ready for dinner without much work. It smells so good too! Yum, pot roast can be so tasty! I don’t think I’ve ever tried putting steak seasoning in mine, I’ll have to keep that in mind. We just made a pot roast at the beginning of the month! Super easy to make and delicious! I love to find new crock pot meals, as a working mom this makes a delicious and east dinner for my family. I love the heartiness of this dish, I am sure my family would love this.